“It’s a raggedy moonscape...” said Neda Ulaby in an August, 2012, piece for National Public Radio—“The Ghostly Grandeur of a Desert Graveyard.” There is, she said, “...no lush green grass or tranquil arbors here. 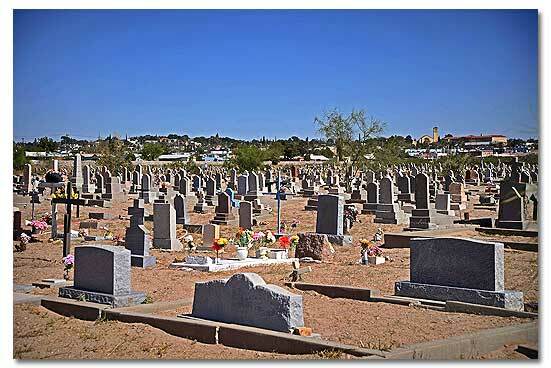 Concordia Cemetery...just a few blocks from the Mexican border, is stark and dusty. It’s overrun with crumbling concrete markers and old wooden crosses gone askew. And it goes on...and on...and on.” Nevertheless, recognized as a Texas State Historical Cemetery by the Texas Historical Commission a few years ago, Concordia, over a century and a half after its founding, stands as one of the crown jewels of El Paso’s past. 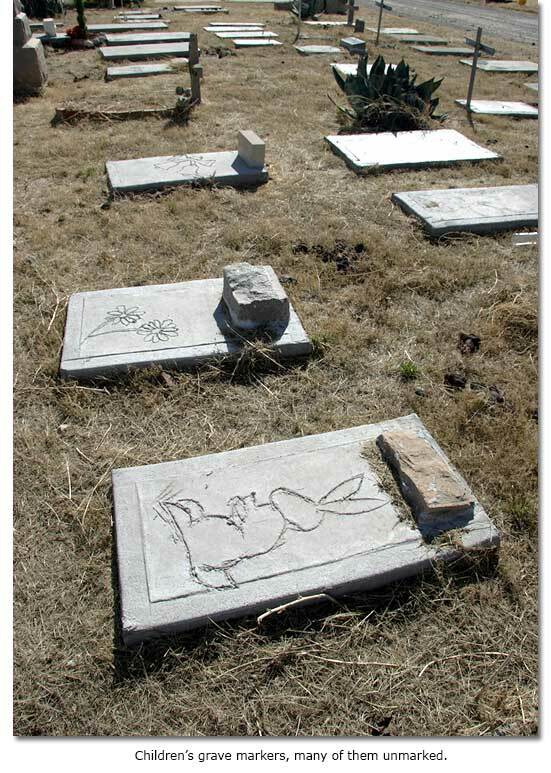 Concordia Cemetery lies on land that was once part of a ranch – the Concordia Ranch – owned by Don Hugh Stephenson, a pioneering miner and merchant in Chihuahua, and his wife, Doña Juana Ascarate Stephenson, daughter of a wealthy Mexican family. 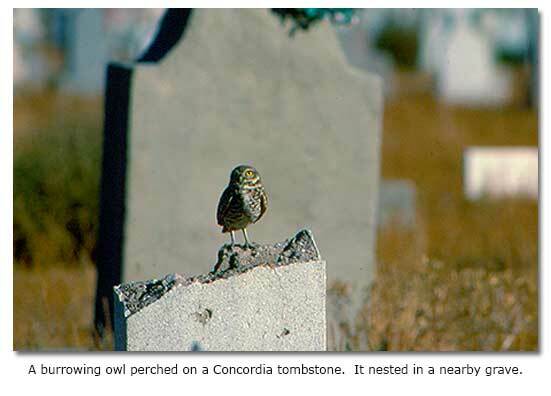 It had its origins as a cemetery in the 1850s as a family burial plot. It is the final resting place of Juana, who died violently under the antlers and hooves of her pet buck deer. In the immediate vicinity of the cemetery the small community of Concordia grew up over time. “Today,” wrote Hamilton and Dr. Martha Deen Underwood, in Concordia: El Paso, A Walking Tour, “the cemetery contain[s] veterans of the Confederacy, the Union, Indian fighters, Buffalo Soldiers and Infantry, US Cavalry, Texas Rangers, Spanish American War veterans, US Sheriffs and Marshals, veterans of WWI, WWII, and Korean and the Vietnam War,” to say nothing of famous gunfighters, Jesuit priests, a Mexican president, Chinese workers, many children, perfectly ordinary people and numerous souls simply lost to history. Concordia spans 54 acres, with sections set aside for the Catholic community, the Jewish community, the Chinese community, Buffalo Soldiers, Mormon exiles, the Infant Nursery, and others. The Catholic community has deep historical roots in the greater El Paso region. It was in April of 1598, on the banks of the Rio Grande, that Juan de Oñate, leader of the first successful Spanish colonizing expedition into the southwest, took possession of the land before him in the name of the Church. In 1659, Franciscans built the Nuestra Señora de Guadalupe mission church in what is now Juarez. Mission churches played key roles in the development of today’s communities up and down the river. Priests presided over many burials in Concordia. “The history of Jews in El Paso is a colorful one, rich in traditions, culture and contributions,” said Laura Gronich in the Jewish Federation of El Paso web site. “Jews came here from all parts of the world and other parts of the United States in search of business opportunities and religious tolerance...” Moreover, she said, “...Jews filled every facet of the population as teachers, politicians, lawyers, landowners and doctors.” Pioneer Jewish merchant Solomon Schutz was elected mayor of the city in 1880. Today, the Jewish section of Concordia, in contrast to neighboring desert sand sections, looks and feels like a well-tended park. The Chinese first came to El Paso as construction laborers for the Southern Union Pacific Railroad, which completed a track through the community in 1881, effecting a profound change across the region. Some would remain in El Paso, opening a rooming house, a grocery store, restaurants and laundries, according to the Concordia Cemetery web site. They maintained their Chinese heritage, continuing their community associations, traditions, language and food. They married and raised families within their community. New Chinese immigrants arrived from the mother country and from Mexico. 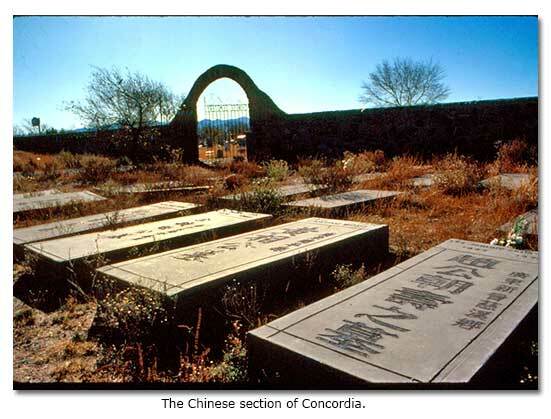 “At one time,” according to the site, “Downtown El Paso’s Chinese Community was the largest in the state of Texas.” Years ago, the Chinese built a wall around their section of Concordia to make it exclusively theirs. Buffalo Soldiers from the 9th and 10th Cavalry and 24th and 25th Infantry served at Fort Bliss from 1866 to 1901. Many of them had been slaves only a few years earlier, before the Civil War. Buffalo Soldiers fought in the Apache wars as well as in other Southwest conflicts. They helped restrain disputes over the rights to salt from the great dry salt lake beds just west of Texas’ and New Mexico’s Guadalupe Mountains. In battle, Buffalo Soldiers won 23 Medals of Honor in recognition of their courage. 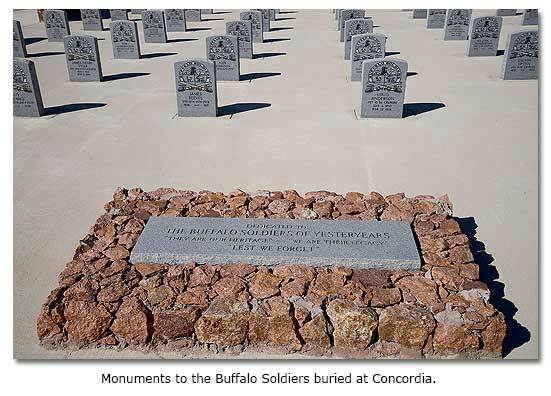 Buffalo Soldiers not only lie buried in Concordia, they are honored by a monument to their valor. Concordia’s Infant Nursery, with numerous miniature unmarked graves, holds memories of many of the diseases of an early 20th century town of the West, but it especially recalls the 1918 Spanish influenza pandemic, which took 40 million people worldwide and hit El Paso hard. “Before the epidemic began to abate in late January 1919,” said Janine Young in an article in the El Paso Times, “an estimated 1 out of 10 El Pasoans had fallen sick and more than 600 had died.” It took a particularly heavy toll on the children. 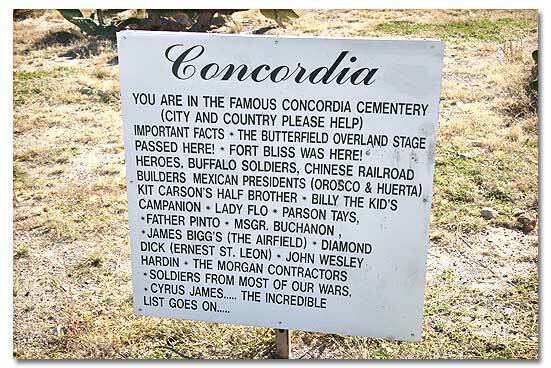 If the communities represented in Concordia’s dedicated sections shaped much of El Paso’s history, individuals buried in the cemetery punctuated that history with their spirituality, their business acumen, their social standing, their political stature, their personalities...and their six-shooters! According to the Underwoods, Father Carlos M. Pinto (1841 to 1919), who is buried here, was a Jesuit missionary priest from Italy who served in the Rocky Mountain region under Santa Fe’s legendary Archbishop John B. Lamy—the inspiration for Willa Cather’s Death Comes for the Archbishop. Father Pinto then served as the pastor of St. Mary’s Chapel in El Paso and as superior of the New Mexico and Colorado Jesuits late in the 19th century, overseeing the construction of five churches and the establishment of several schools in the El Paso/Juarez area. He staffed and supervised parishes in the border cities as well as mission churches in the Rio Grande Valley. Celia Enriquez, on the El Paso Community College website, writes of Adolph Schwartz (1867 to 1941), a Jewish immigrant from Stropko, Hungary. He landed in El Paso/Juarez, at the urging of relatives late in the 19th century. In 1902, Schwartz founded the Popular Dry Goods Company, which would become the largest privately owned dry goods store in El Paso. Schwartz cultivated a diverse customer base, including representatives from both sides of the Mexican Revolution (1910 to 1920). In fact, at one time, he had opposing leaders Pancho Villa and General Francisco I. Madero shopping in his store at the same time, fortunately each unaware of the other. Over nearly a century in the business, said Laura Gronich, in her article, “Shalom Ya’ll,” Schwartz and his descendant store owners and managers became a major business and civic presence in El Paso.